I Can’t Wait for November! Why can’t I wait for November? Because flea market season will be over, Salem will return to “normal”, my work schedule slows down, and HOPEFULLY I can get my apartment back to something livable! 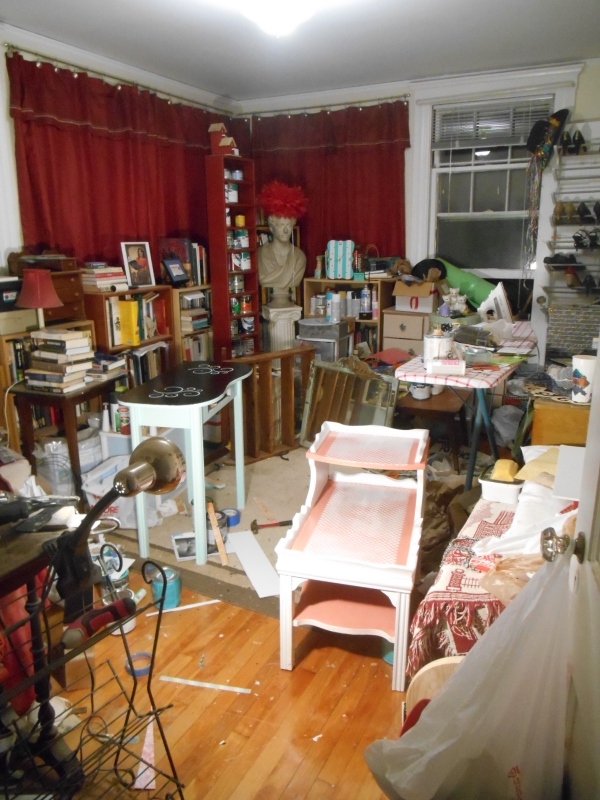 I hate feeling like a hoarder and with so many projects and messes all over the place!! I really do have a great apartment, but this is what happens when I’m not home very much and my apartment is my workshop! This is/was my dining room! Underneath all that furniture is a beautiful wood paneled room that was the “selling” point for me when I saw this apartment. It has a real arts and crafts feel which I love! Somewhere in there is a large dining table and six wrought iron chairs with cute upholstery! I hope to see it again in the fall. Lots to flip and sell!! This is my living room. Sorry, it’s sort of a blurry photo. Granted last night when I took the picture it was worse than usual. 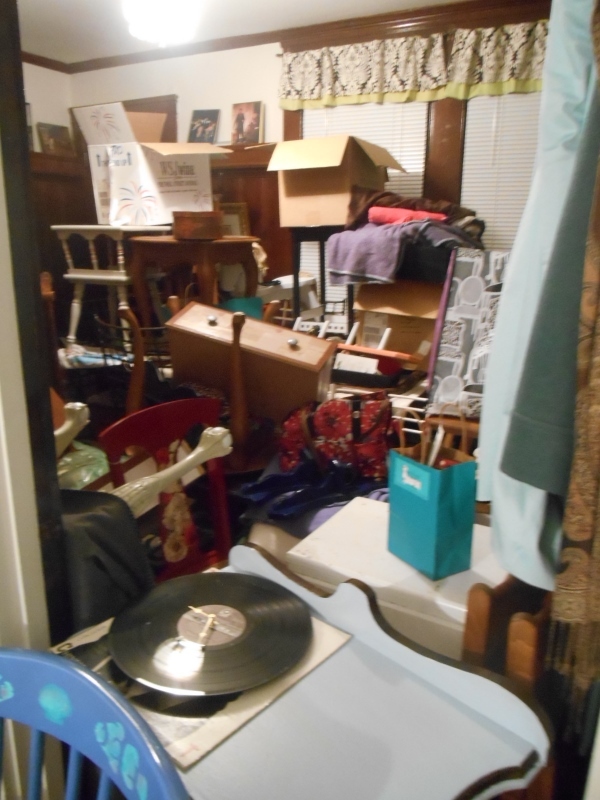 I do TRY and keep the living room and bedroom free of flip stuff. The bedroom is safe, WHEW!! 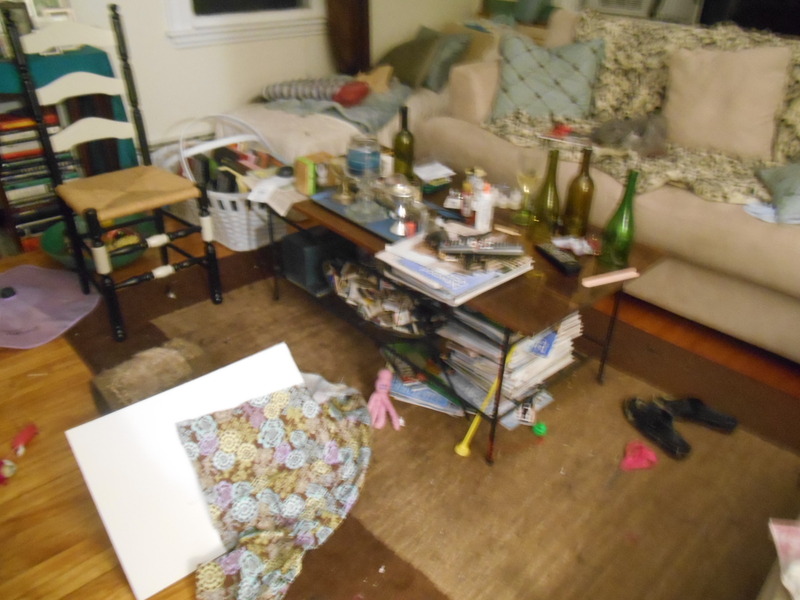 But last night small projects found their way into the living room. Hey, it was cooler in there and the clock, lantern, and cork board projects could be worked on easily in there. Tonight it is almost back to normal! The workroom. It used to be my guest room and library. Ugh. It will likely remain a mess for a while. So, welcome to my world and the mini tour of my very full apartment!! I think maybe this will be fodder for another Before and After post!! What do you think??? ← For Sale Now!! But also Sunday.